When you're sick of the long cold dark winter days here in Sweden, where would you go for a vacation? SPAIN for me please. We chose the warm and sunny Andalucia to welcome 2018, and that was the best choice we could have made. I loooooooved Andalucia, every city that we visited, I loved them all. Still, my most favorite city was, *drum roll*, Granada! Filled with history and mixed culture, beautiful streets with historical monuments here and there, great night life with hundreds of bars and bodegas, great food, great wine, everything within walking distance, I really wished I could live there (I know I say that to a lot of cities but seriously Granada is on top of my list). Here's my top 5 things that anyone who visit Granada should definitely do, actually MUST do, because you will regret it if you didn't! Tapas is obviously a part of Spanish culture but in Granada, they come with a twist. You are offered a free tapa for each drink or each round of drinks you order! The portion, although not a full meal, was quite generous and you can get full after 2 or 3 rounds of drink. And the drinks here are super cheap too, usually around 2 to 2.5 euros for a small beer, or sangria, or mosto (a kind of Spanish grape juice, great alternative if you wanna stay alcohol free! ), or even gazpacho! I am a foodie and I love this! When I and my bf stayed there, we usually just went out and had 3 rounds of beer instead of having dinner because we could totally get full sharing those free tapas together. 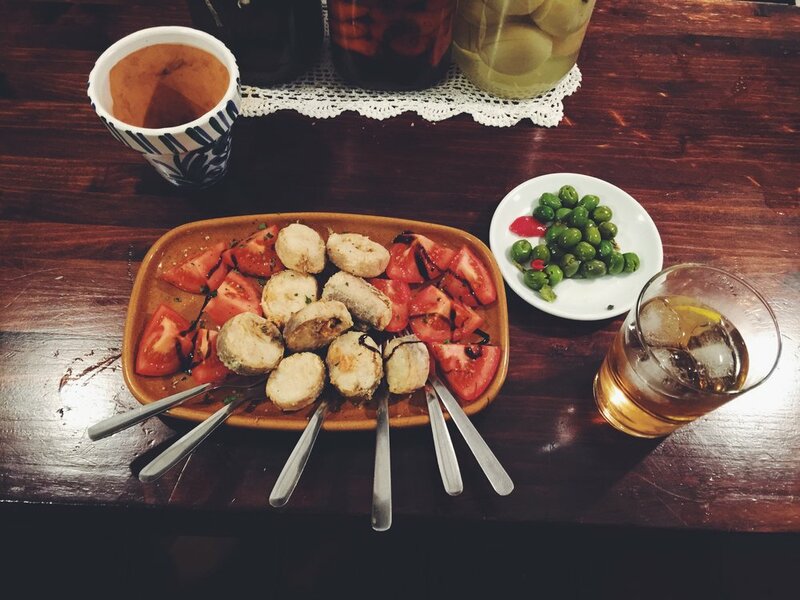 What's even better is that they will give you different types of tapas for each round so you can try different types of dishes they have there. Some places would even let you choose what kind of tapas you want to get. Some places wouldn't, but it would be a nice kind of surprise because you would feel like Forrest Gump with a box of chocolate, never knowing what you're gonna get and still ending up loving it anyway. And every different bar would have their own menus so you could just bar-crawl and taste every de-freaking-licous dishes that the city has to offer. One of my favorite place was Los Diamantes. They were at three locations that you could go to and they serve freaking great seafood dishes with the drinks. Unfortunately, they were always crowded during meal time or in the evening so it was super hard to get a place, especially if you come with a group. The best tactic is to go by two, so perfect for couples, and squeeze yourself in there, you would be more likely to get a standing place next to a table or the bar. No more personal spaces here (I'm serious, you'll be standing back-to-back with some other people), loud and busy from start to finish but it was an amazing experience. We managed to have food and drinks at Los Diamantes quite a few times when we were there because we loved it so much. And of course there are several wonderful bars everywhere so be adventurous! I bet you'll have a great time anyway. Mix fried seafood at Los Diamontes, and mosto again really? Did I really eat that many fried stuff and drink that many mosto? This is such a classic thing to do in Granada because the Alhambra is so freaking famous already. The Alhambra is an Islamic palace that was built on the remains of a Roman fortress. I can't remember the history (that's a reason why history was my least favorite subject of all time) but the architecture is so amazing and the views are breathtaking. This was my first exposure to the Islamic architecture and I immediately fell for it. I love every little detail on the walls and doors and everywhere. No word is gonna be able to describe it really, you gotta go see it for yourself. Albaicín is a district of Granada that situates on a hilly part of the city, opposite to the Alhambra. Here you can find the medieval moorish narrow cobblestoned streets with beautiful traditional houses and flower-filled balconies, some quiet small squares here and there and glimpses of the Alhambra around each turn. I've been wishing that I owned a winter home in this lovely neighborhood ever since, such day dreaming eh? Take your time to enjoy this area and remember to wear comfy shoes. Also be sure to stay and watch the sunset slowly lighting up the Alhambra from here. It's a magical sight that you wouldn't want to miss. We loved Albaicín so much that we decided to find our way back there the next day, just to find out in the end that we went all the way up to Sacromonte instead. It was a totally lovely surprise. It turned out that if you keep climbing up from Albaicín, somehow you will reach Sacromonte at the top of the hill. But don't listen to my instruction because it was just pure luck, following Google maps would get you there. This area is said to be the traditional neighborhood of Granadian gypsies, filled with cave houses, cactuses and beautiful landscape. From here you can also see the Alhambra and even the peak of the snow mountains. We even walked past an olive garden on the way and had time to pick a handful of those. When you stroll down from the Albaicín to get to Plaza Nueva, chances are you will pass by the Arab market street. This narrow and steep street is packed with local Arabic souvernir shops from both sides, where they put out hundreds of beautifully crafted items for you to see. The whole street is almost covered by colorful fabrics of different sizes and patterns, lighted up by a few lanterns here and there. Make sure to stop by a tea shop on the side of the street to try the wonderful tea collection that they offer here, and maybe smoke a hookah while enjoying the interior of the tea shop because that is also an experience of its own.